The Kingdom of Saudi Arabia has affirmed its constant stance towards the Palestinian people and their just issue. The Kingdom considers the Palestinian cause at the forefront of its concerns. Its stance has always been based on fixed principles and aimed at achieving a just and comprehensive peace on the basis of the restoration of legitimate rights, including the legitimate right to establish its independent state with East Jerusalem as its capital in accordance with all relevant resolutions of international legitimacy and the Arab Peace Initiative, which has gained the welcome of the international community," said Custodian of the Two Holy Mosques King Salman bin Abdulaziz Al Saud at the opening of the second year of the 7th session of the Shura Council on the internal and external comprehensive policies of the Government of the Kingdom of Saudi Arabia as well as its achievements over the last year. 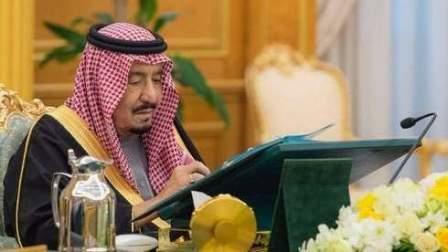 "Kingdom of Saudi Arabia affirms its strong condemnation of the US decision on Al Quds, a blatant bias against the historic and constant rights of the Palestinian people in Al Quds," King Salman continued today. "With regards to the Yemeni crisis, the determination storm and restoration of hope were not only the first choice for the coalition states to support legitimacy in Yemen, but a duty to help the Yemeni people. We are still committed supporting the legitimacy in the Republic of Yemen in order to impose its authority on all Yemeni territories. We seek to reach a political solution in Yemen in accordance with UN Security council resolution No. 2216, the Gulf initiative and its executive mechanism and the outputs of the national dialogue leading to the beginning of a transitional phase achieving stability in Yemen and then start reconstruction and rehabilitation of the country." King Salman added that the Kingdom always supports the suppressed and bereaved people in all parts of the earth. "The Kingdom's stances are witnessed and known with regard to the Islamic issues in various parts. The Kingdom of Saudi Arabia has condemned the violations of the rights of the Rohingya Muslims and the burning of their mosques. The Kingdom has contacted with the United Nations Secretary-General in this matter, resulting in immediate condemnation by the United Nations. The Kingdom has also called for a UN resolution condemning these violations." "Our Arab region is ravaged by a dangerous phase of many crises and conflicts. We have to be vigilant and cautious at what is plotted against our security and stability. In this domain, we work with our allies to confront the tendency of interference in countries' internal affairs to fuel sectarian strife, undermine regional security and stability and support terrorism," he remarked.